†A hit with your child! If you are looking for a great way to introduce the rosary to your child, or grandchild, then the Rosary Companion is exactly what you need. Passing on our traditions, and getting children started on a lifetime of devotion to the rosary is the mission of us here at Rosary Evangelist Inc. With the colorful lights and the voices (courtesy of the Sisters of the Carmelite Monastery in Lafayette La. ) the Rosary Companion immediately captivates children of all ages. With each push of the central rose imprinted button, the Rosary Companion actually prays along with your child just like being in a group praying the rosary. In addition, lights around the outside easily mark their progress around the decades of this rosary ring, making it impossible for your little one's to lose their place. A child who has never said the Rosary before can instantly pray all five decades including the mysteries! Also, packed into this rosary ring are beautiful bible verses that are announced with each of the twenty mysteries, following Pope John Paul's directions for properly praying the rosary. A switch on the back easily allows the user to select between the Luminous, Joyful, Glorious, and Sorrowful mysteries. Add more fun and interest to the family Rosary time! 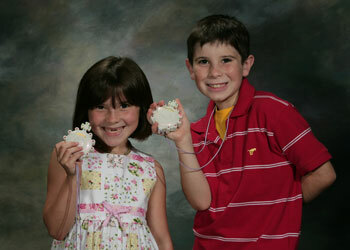 Or better yet, with the Rosary Companion, your little one can lead the whole family all by themselves! "The faithful children of the rosary will merit a high degree of glory in heaven". Learn the Rosary pray the Rosary, no experience required! "Whether you are new to the rosary, or already Know and love the rosary, we pray that the Rosary Companion, thru Mary, will bless your life and that the Rosary becomes a part of your daily devotional"